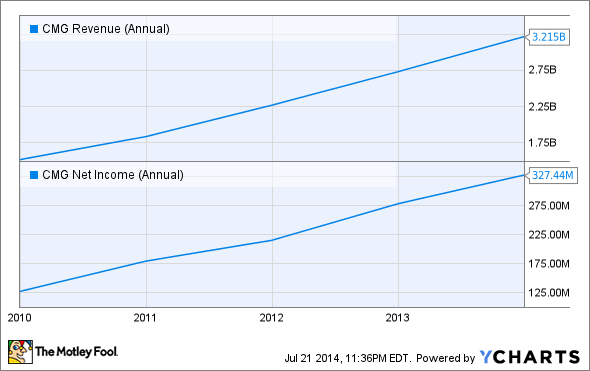 Should You Invest in Chipotle Mexican Grill Stock? 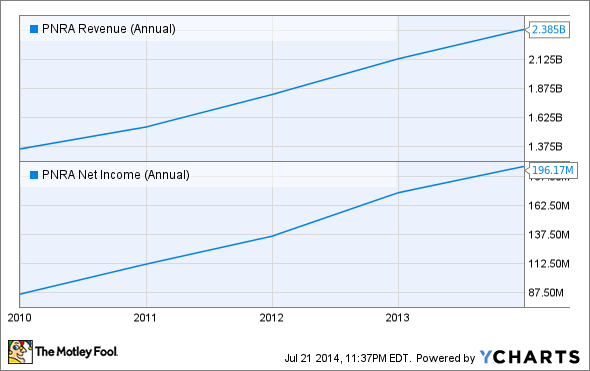 The past few years, and even this past quarter, have been amazing for Chipotle. However, given the cost investors must pay for this growth, might it be a better idea to look at one of the business's rivals like Panera Bread Company? After the company announced revenue and earnings results for the second quarter of its 2014 fiscal year on July 21, shares of Chipotle Mexican Grill (NYSE:CMG) soared 10% in after-hours trading to hit a new 52-week high along the way. In spite of its high P/E ratio of 62 and market cap of $20.4 billion, the gourmet burrito maker shows no signs of tiring. Given these developments, does time remain to invest in Chipotle and gain attractive upside, or should investors give the much cheaper Panera Bread Company (NASDAQ:PNRA.DL) a shot? Mr. Market had high expectations... but not this high! For the quarter, Chipotle reported revenue of $1.05 billion. This came in 29% above the $816.8 million it reported in the year-ago quarter as the company blew past the $988.9 million anticipated by analysts. According to its press release, this rise in sales was driven, for the most part, by a 17.3% jump in comparable-store sales as a slight increase in menu prices complimented higher traffic. Another big driver behind Chipotle's growth, however, was the company's significant store count growth. During the quarter, management added 45 new restaurants. This, combined with the growth experienced by the business in previous quarters, led the company's number of locations in operation to soar 12% from 1,502 last year to 1,681 today. From an earnings standpoint, the company's growth was impressive, but not quite as impressive as its jump in sales. For the quarter, Chipotle reported earnings per share of $3.50. This represented a 24% jump from the $2.82 per share that management reported for the second quarter of 2013 and came in nearly 14% higher than the $3.08 Mr. Market hoped to see. Even though it benefited from higher sales, its food, beverage, and packaging expenses increased from 33.1% of sales to 34.6% and this negatively affected the business. The past few years have been extraordinary for Chipotle. Between 2009 and 2013, the restaurant chain reported a 112% increase in revenue from $1.5 billion to $3.2 billion as an aggregate comparable-store sales jump of 41% was accompanied by a 67% rise in store count from 956 locations in 2009 to 1,595 by the end of the business's 2013 fiscal year. During this time-frame, higher revenue combined with greater economies of scale sent Chipotle's net income skyrocketing 158% from $126.8 million to $327.4 million. However, there is one bad thing about the burrito giant; it's expensive! Using last year's earnings and this year's price, Chipotle is currently trading at 62 times earnings and over 6 times revenue. Using forecast results for its 2014 fiscal year, the business looks a bit cheaper, but far from a bargain at a P/E of 51 and about 5 times revenue. From an earnings perspective, this means that if Chipotle were to cease growing and retain its profitability, it would take investors 51 years just to earn the money they invested in the business back. To put this into perspective, let's look at one of the company's biggest rivals -- Panera. Over the same five-year period, Panera's revenue shot up 76% from $1.4 billion to $2.4 billion. Like Chipotle, Panera's growth was driven by a nice uptick in aggregate comparable-store sales (29%), but the business's store growth of just 29% from 1,380 to 1,777 was noticeably slower than its rival's growth. Looking at profits, the restaurant posted results a bit closer to those of Chipotle, with net income jumping 128% from $86.1 million to $196.2 million. With growth that is lower, but not much lower, than that of Chipotle, it might be tempting to pass on Panera without even looking at its cost. This would, however, be a mistake. Because of fears that the company's growth is beginning to slow, shares of Panera are significantly cheaper than those of its peer. Using 2013 metrics, the business is trading at a more modest 22 times earnings and less than 2 times revenue. With the assumption that analyst forecasts are accurate, Panera is trading at 21 times earnings and 1.55 times revenue for 2014. There's no denying that Chipotle had an excellent quarter. Even though the business increased its menu prices, its sales skyrocketed to new highs and earnings have followed suit. Moving forward, it's likely that the company will see revenue and earnings climb higher, but investors should understand that this growth is coming at a pretty hefty cost. While this is a nice trade-off for some investors, those who prefer something a bit cheaper may want to look at Panera. Yes, the company is showing signs of slower growth, but with shares of the business trading at such a steep discount in comparison with those of Chipotle, Panera might make for a good long-term prospect.